Daily Illuminator: In Nomine, GURPS Style! April 22, 2008: In Nomine, GURPS Style! 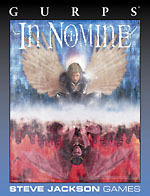 We like In Nomine. Playing angels, demons, and . . . well, angels and demons are quite enough, actually. And as much as I personally enjoyed the original system, I do recognize the awesome that comes from getting nitty-gritty with the details, you know? And that's why I'm so happy we did GURPS In Nomine. Warriors of Light, singing Songs that literally rock the house and kicking demon tail, with all the crunchy details of GURPS. Alternatively, you could be fallen angels, just looking to make a buck and stay out of the way of your Boss. Either way, having a wide variety of skills and advantages at your disposal to personalize exactly how you're doing whatever you're doing for eternity is, to my mind, Darned Nifty. Of course, now that it has been released on e23, my excuses for not re-igniting my Austin-based game grow ever small. So much gaming; so little time!